Well-known social media author/blogger Brian Solis once wrote, “Social Media is about breaking down barriers to engage in conversations.” Unfortunately, a lot of marketing teams forget that a social networking site like Twitter is all about conversation and to truly establish meaningful conversation you have to build a relationship with those who discuss your brand, product, or marketing effort. Twitter accounts established solely for marketing campaigns are pointless and essentially demonstrate a marketing team that doesn’t really get what Twitter or even conversational marketing is all about – relationships. I have been following several automotive marketing campaign Twitter accounts created to extend a campaign into the popular social media site. After watching many of these efforts, it became quite clear that the “conversation” only lasts until that campaign’s marketing team is reassigned and budget is exhausted. Communications average 263 tweets during the limited time the accounts are active with most producing only around 100 tweets. Two campaigns here showed significantly higher engagement levels. The Hyundai @roadtrip149 account was giving away free iPods last August and this created a lot of Retweets and promotional communications for the iPod giveaways. Kia’s @KiaCollective account promoted several free concert events on its microsite that were part of its campaign which led to a lot of communications out to followers about new concert announcements. The only account I could find that was decent at establishing relationships with their followers was the Volkswagen @SluggyPatterson campaign. The Punch Dub campaign the Twitter account references is personified by a grumpy old man named Sluggy Patterson who supposedly invented the Punch Dub game, where one punches someone the minute they see a VW. Engagement happens by interacting with this fictional character who seemed to mimic the popular Twitter identity @ShitMyDadSays. The account did enhance the marketing experience and really did work well to promote the campaign’s concept. Unfortunately, the team doing it only participated for 67 days. All seven of the examples here are dormant Twitter accounts since they have been inactive for months. Of the seven only one account actually told its followers to follow the primary Twitter account for the brand. 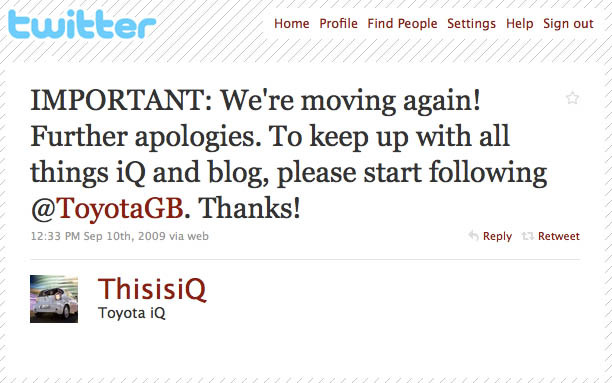 The @ThisisiQ account from the UK directs its followers to move to the @ToyotaGB account to continue engaging with the iQ and its blog. One thing is very clear when it comes to marketing campaign Twitter accounts, they don’t last long enough to provide any relationship with its followers and since there is no significant engagement there is no significant value. Brands really need consider if accounts like these are worth the effort? I’m sure some resources had to be funded to support the Twitter accounts and by the look of things the benefit to the brand and campaign is minuscule at best. If marketing teams really want to bring their campaigns under the social media umbrella, they should do so using an established brand Twitter account that can be used to continue the relationship keeping it fresh and, most important, long-term. An example of this strategic approach is what @Jeep is doing with its Tiki Hunt marketing effort. 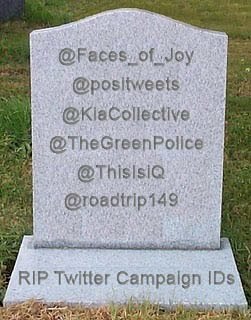 They did not establish a Tiki Hunt Twitter account to engage with people; instead, they are directing people to the @Jeep account and building followers and fostering engagement through their brand account which will continue to engage their followers long after the Tiki Hunt campaign is over.